Register for a first order discount to buy this for just £6.18, saving £0.33. Have a thing for horses? 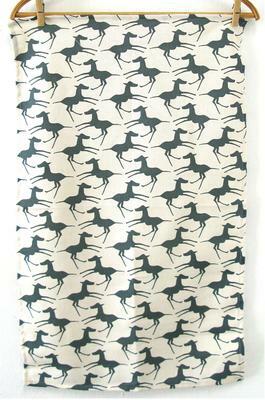 Then this Skinny Laminx Tea Towel Colts in Teal would make you happy! Made from 100% cotton, this piece was inspired by the San people, a group of hunter gatherers found in the Cederberg Valley of South Africa. This beautiful design is simple but it definitely has a lovely charm. Use this for your tea time or maybe for cleaning up after yourself while in the kitchen. It's easy to clean, versatile and quite stylish.